In celebration of Saturday (because any day you can eat Jerky is worth a bit of celebration) we’re training our taste on a bag of Oberto Applewood Smoked Bacon Jerky purchased while traveling in Toronto, Ontario. Taste (B+): Yay, bacon! This jerky tastes like slices of good ol’ bacon. Really, how could that not be pretty awesome? Your first impression is the applewood smoke flavor. It’s simple and enjoyable. The next thing you’d notice is the saltiness of the bacon. It’s very salty, but not overly so, and does manage to pair nicely with the smokiness. And… that’s about it. It is salty smoked bacon in a bag. Nice. Texture (B-): Tender and dry, this jerky tears easily and chews with only a minor effort. The pieces are sliced relatively thin and are enjoyable to eat. Smell (B+): Behold the scent of smoked bacon! This jerky smells just like it tastes and that’s a good thing. The scent, mostly applewood smoke, is very appetizing and gives you a clear impression of the taste to follow. The smell is strong, but not at all overbearing, and is really quite a pleasant introduction. Appearance (B+): This jerky looks like tasty bacon. Again, nice. This relatively lean bacon is sliced thinly and has an attractively marbled appearance ranging from light creamy brown to dark red. The slices are packaged in half-strip lengths and vary in width. Their natural bacon shape just further reinforces that you’re getting real bacon in the bag. Consistency (B): It’s a tricky thing trying to wrangle naturally inconsistent bacon into a consistent jerky, but the folks at Oberto have done an admirable job of it. The slices are cut uniformly thin is predictably dry piece to piece. The pieces come in two general sizes: half-strips and bite-sized. The flavor of the jerky, particularly the intensity of the smokiness and the salt, is remarkably solid throughout the bag. Given that the lean/fat ratio of any given piece of bacon jerky can range pretty significantly, this shows a level of quality that is definitely worthy of kudos. 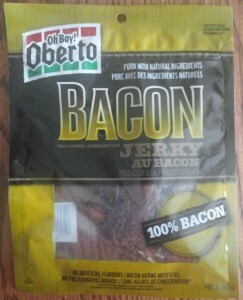 Overall Impression (B+): This is a well done bacon jerky, and even slightly better than the others we’ve reviewed. It’s a simple, straightforward bacon with a strong smoky flavor and a great eatable consistency. It looks good, tastes good, and really… it’s bacon in a bag. If you run across a bag of this tasty jerky feel confident in picking up some for yourself. Eat and enjoy! Tagged applewood, bacon, oberto, pork, salty, smoked, thin. Bookmark the permalink.